Born in Tripoli on 21st January 1959, Victor Massiah was awarded a degree in Economics from “La Sapienza” University in Rome and he commenced his career when he joined Andersen Consulting in 1982. 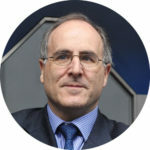 In 1997 he joined Banco Ambrosiano Veneto; in february 1998 he was appointed Chief of the Commercial Department and then Deputy General Manager. Following the merger of Banco Ambrosiano Veneto and Cariplo, an operation from which Banca Intesa was formed, he was appointed Chief of the Markets Area in 1999 and Deputy General Manager in January 2001. From 2007 he occupies the position of General Manager of UBI Banca and from 2008 he is Chief Executive Officer. He is member of ABI (Italian Banking Association) Executive Committee and a member of the Board of Directors of Interbank Deposit Protection Fund. From 29 September 2017 he is President of the Association for the Development of Bank and Stock Exchange Studies.